Restore surfaces to a deep and rich finish! Solution Finish Trim Restorer restores surfaces to a deep, rich finish, without any "wet look" or shine. This unique formula combines ancient ingredients with advanced polymer technology to provide a spectacular, long-lasting, protective finish. Use it to restore, condition, and protect bumpers, pads, trim, mirrors, mud flaps, window trim, seals, running boards, truck bed caps and covers, handles, wiper blades, etc. For best results apply to a clean cool surface, wearing gloves and eye protection. Apply a small amount of Solution Finish to an applicator pad, spread thin, and allow the solution to dwell for 1-2 minutes. Then using a clean microfiber sponge or foam pad buff off the excess product off glass and paint. Another big plus with Solution Finish is that it is formulated for professional use, meaning it is a silicone-free solution that uses all natural oils and is VOC compliant. If you are looking for a great product to help restore faded trim, look no further then Solution Finish Trim Restorer! Black- This formula is perfect for any black trim you are looking to restore. Grey- Any grey trim pieces need some love? This formula is great! It was extremely easy to use and provided fantastic results. A little product goes a very long way, so even the smaller 1oz bottle would be enough to cover quite a lot of trim. If you're looking for a quick and easy way to protect your trim, consider giving Solution Finish a try. I was very pleased with the results that I got! Solution Finish is a product you can rely on to give amazing results. I always make sure I have a bottle in the shop to offer my customers a trim restoration package. As Detailers, it's important to discipline and offer a multitude of services to your client's. Don't just educate customers on polishing paint, Educate them in every aspect. Solution Finish Trim Black restores faded, discolored and oxidized surfaces back to a deep, rich black "better than new" finish. Until now this product has only been available to professional detailers and body shops. Now you can get the same spectacular, long-lasting results as the pros! Solution Finish is an incredible new product that restores originally black surfaces to a deep, rich black finish, without the "wet look"! 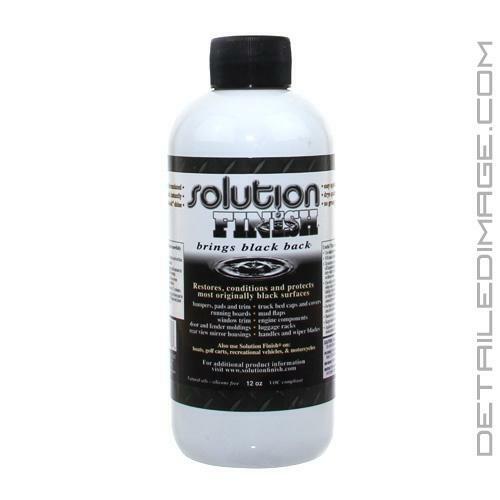 Solution Finish dries quickly with no greasy residue. Our unique formula combines ancient ingredients with advanced polymer technology to a provide a spectacular long-lasting, black protective finish. Formulated for professional use only, it is a silicone-free solution that uses all natural oils and is VOC compliant. Solution Finish is ideal for restoring, conditioning and protecting any originally black surfaces. finish also works great on grey! If it's made of black plastic or vinyl, Solution Finish will make it look better than new! Please read instructions carefully before using. For best results, apply to a clean, cool surface. Wear gloves and eye protection. Shake Solution Finish bottle well and apply small amount to microfiber applicator pad. Spread a thin coat over area in an even motion, covering area completely. Use the detailing towel to wipe off glass and paint (will stain unsealed paint). Note: Kit includes 4oz bottle of cleaning solution for preparing especially greasy surfaces. The product did blacken the faded plastic around my truck bed. The problem was when it rained a couple of days later it bled down the paint. So, I grabbed a quick detailer & a microfiber towel & wiped it off. Now I need to treat it. Great product...goes a long way and is easy to use. But it folks! Amazing product. Will literally turn old, weathered black plastic back to looking new again and it looks like lasts quite a long time and is durable! You go above and beyond for your customers and that is why I will be a loyal DI customer and let everyone know about you guys.